0-4 weeks For the first few weeks of life the newborns are housed in the Infant Room. 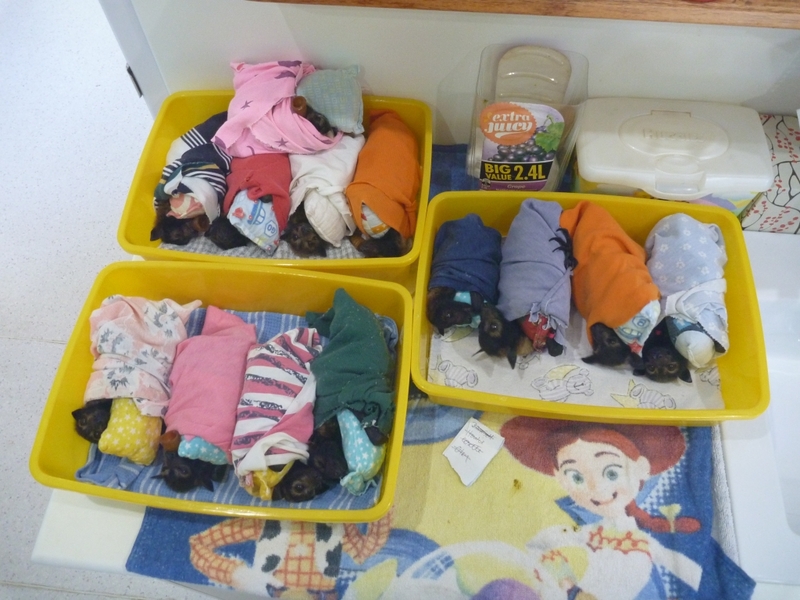 They cannot maintain their own temperature and heating pads are used in their boxes. 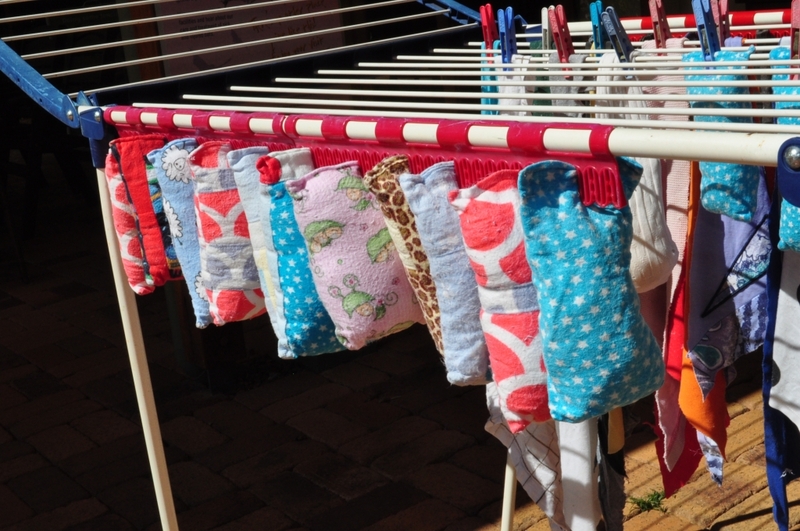 They have sock mummas to hang on to. 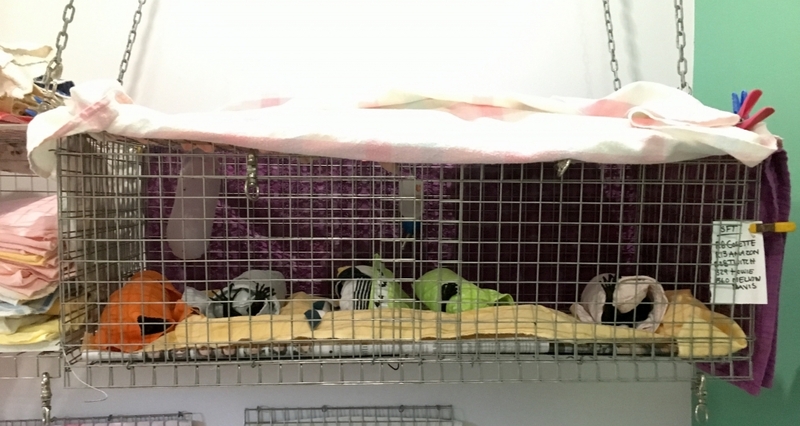 The boxes have been designed with mesh tops that allow the pups to move around in the boxes, but they mainly eat and sleep for the first 2 weeks. 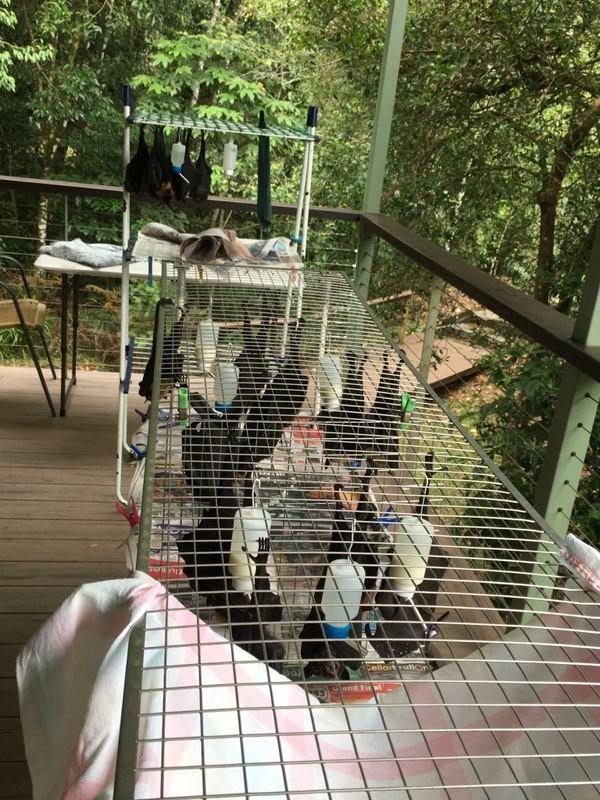 The tops are also pegged up onto the verandah railing so that the young pups can stretch out and get sun each day. Depending on the weather they may also spend time out of the boxes on modified clothes airers especially at 3-4 weeks. 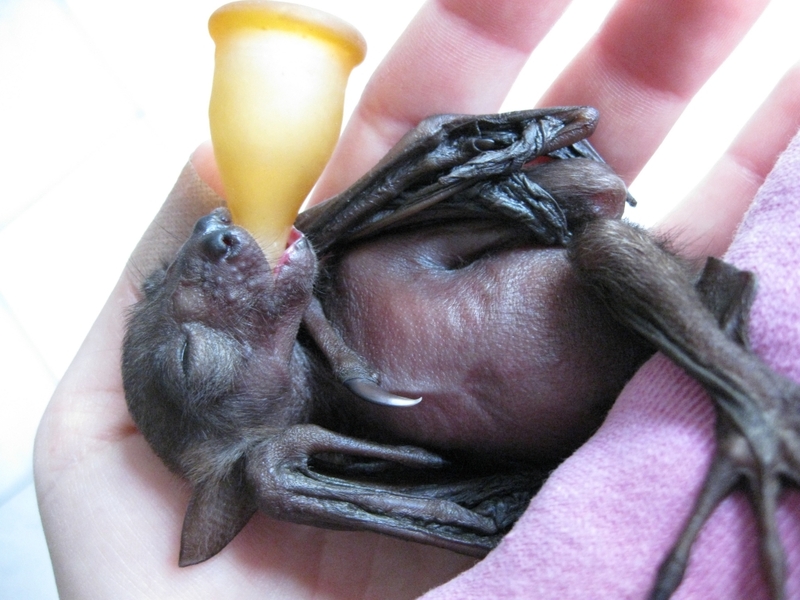 Their lives in care are very tame compared to life in the wild at this age – hanging onto their mother’s body while she is flying and landing/taking off sometimes with no warning. Their mothers are also skimming the top of bodies of water to get a drink. Their belly fur gets saturated with water and the baby with it. It’s very easy to treat this age group with too much ‘mollycoddling’. The young are fed with a teat through this stage. 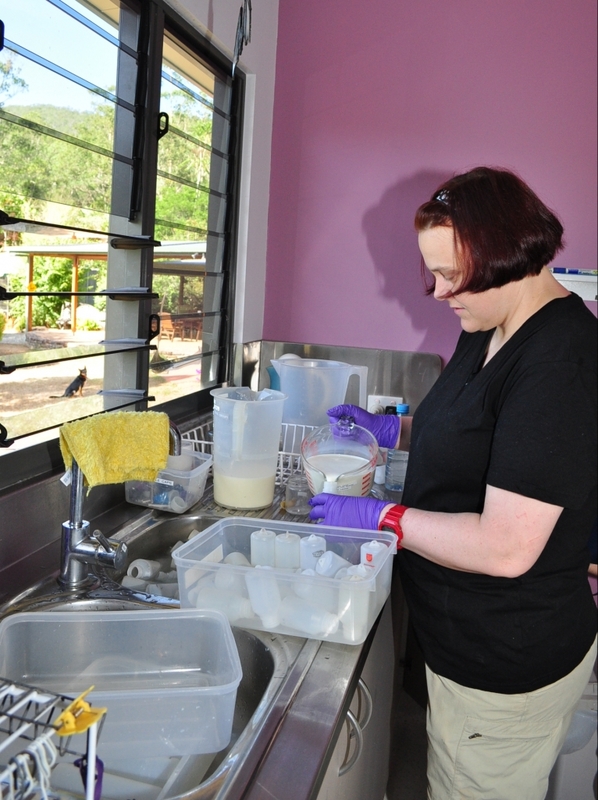 Some begin with syringe feeding of milk through a teat, some straight onto a bottle and teat, and when we are overwhelmed with numbers some are ‘box-fed’ with bottles. The Infant Room. The name and thumb band number of each bat in these red boxes are clearly labelled on the front. Some require housing in an ICU such as the one on the left hand end. 4 weeks There is a transition phase where the pups are still in the Infant Room but in an upper ‘bedroom’ at night while they master the art of self-feeding from dripper bottles. Here we can monitor them closely to see how much they drink and if they can cope with hanging all night. 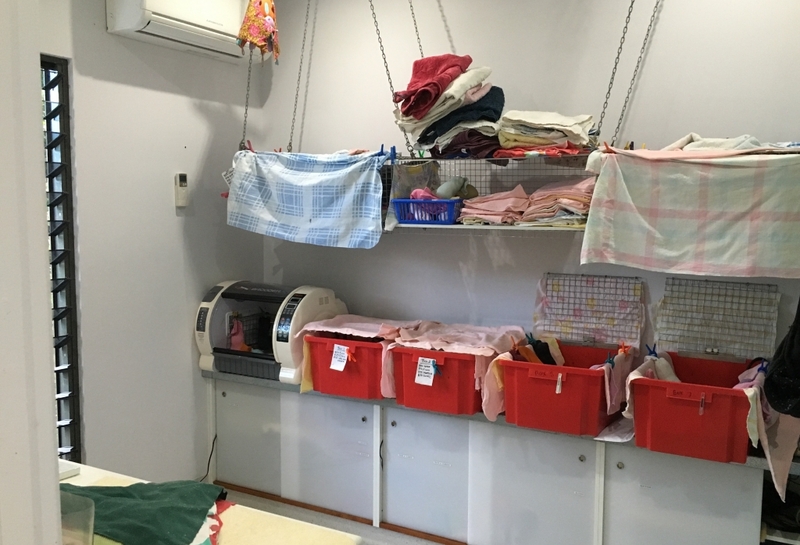 Photo above left shows the bedrooms are covered so that volunteer activity in the Infant Room doesn’t disturb the pups who are sleeping early morning. 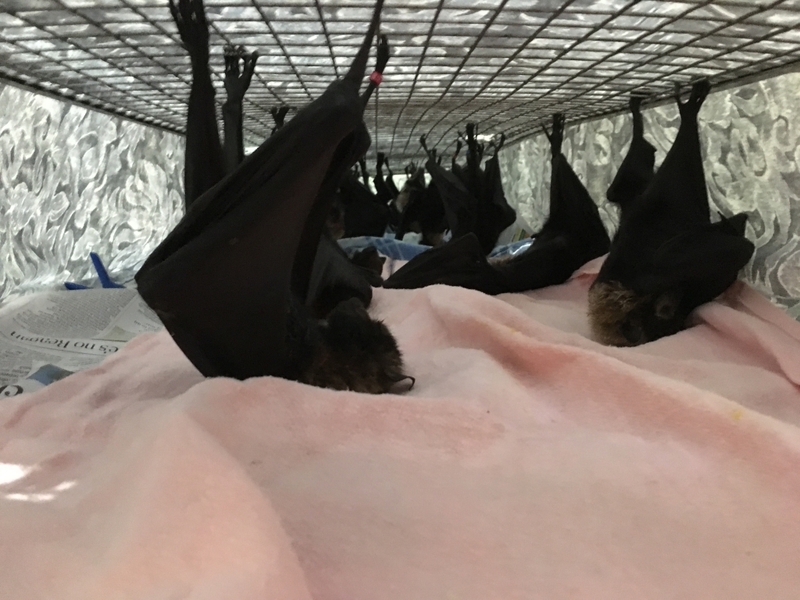 These bats in the upper bedroom are now wrapped and lying down after a top-up feed. They will be toiletted after about 20minutes and left wrapped very loosely. They’ll climb up when they’re ready. 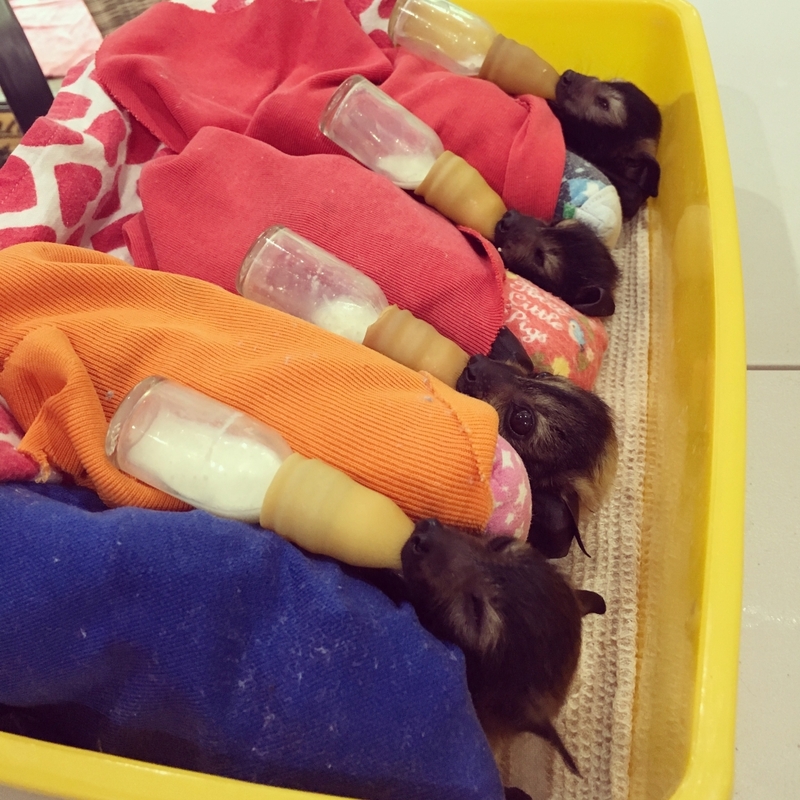 Some of them are initially quite exhausted after their first night of hanging while learning to feed themselves on the dripper bottles. 4-8 weeks The pups can now feed themselves from dripper bottles and they move into the Jungle Gym, a room where they can climb around at night. 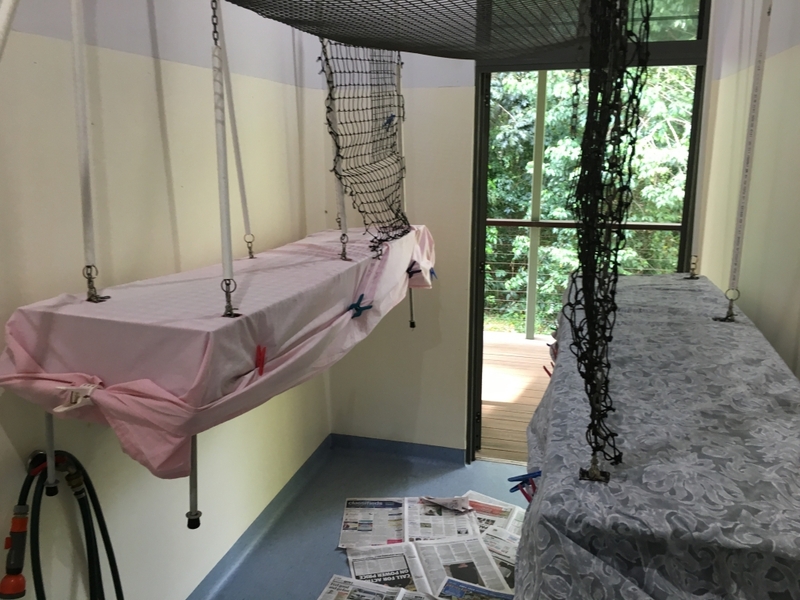 They hang from custom-built frames that allow the frame floor to be raised so the pups can lie down, in the same way that the pups lie down in their mother’s wings. This is the age where they are too heavy for their mothers to fly with, and they stay in the trees at night with the other pups. The pups have a 2-3 hour lie-down first thing in the morning and again about 5pm. During the day the frames are carried outside onto the verandah, or even onto the lawn. We want the pups to get enough sun each day, weather permitting. The main advantage of the frames is the ease and efficiency of moving large numbers of pups into lie-down, up again, outside onto the verandah and back inside. Inside the Jungle Gym the frames hang from from chains attached to the ceiling. They easily clip or unclip from the chains. Photo: (right) We cover the frame with a light sheet during lie-downs. 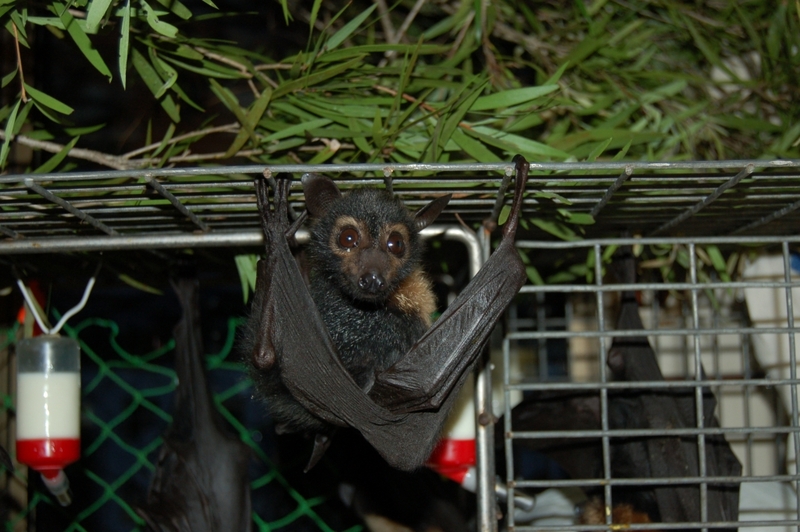 Note, pups can climb off the frames at night via the netting that connects up to the mesh hanging area. Some pups do not want a lie down! Behind the frame is a vertical clothes airer for specific small groups of pups who we want to keep an eye on. In the foreground on the frame is a sling for younger pups to rest in. We use whiteboards to follow the progress of the pups in the early stages. With quite a lot of volunteers it’s important to communicate the amounts of milk being fed to each pup, and this changes regularly. 8-12 weeks The pups are now moved to an outside cage close to the house where it is easy to keep an eye on them. Fruit is introduced at this age, initially soft fruits like watermelon, rockmelon and pears. 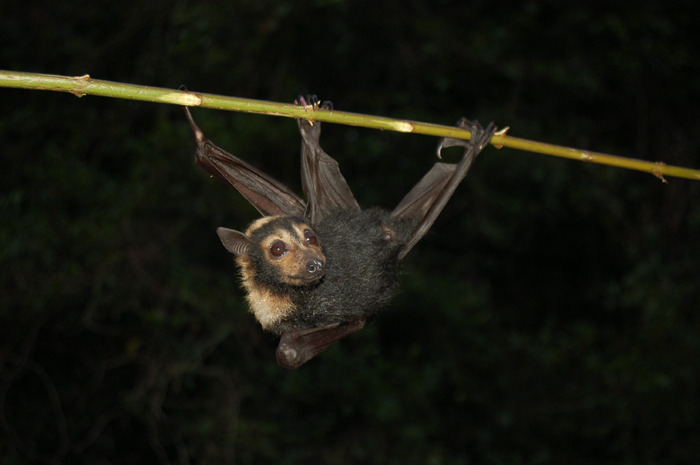 In the wild, the pups would have little or no access to fruit until they can fly at 3 months of age. We progress them onto softer varieties of red apple such as galas and dels rather than pink ladies. We hang all fruits on wire ‘necklaces’. This encourages work / play for their food. It is very important that the pups have lots of opportunities for climbing and flapping. 12-16 weeks The pups are moved to the large flight cage so they have plenty of space for flying. Here they learn many things including not to bother the resident adults. In the wild the pups would normally only be relating to their mother and peer group. Release At about 450 gms of weight and a minimum of 140mm forearm length we move the orphans out to the forest for a soft release at the release cage. We move them out in groups of 10-30 until early April. 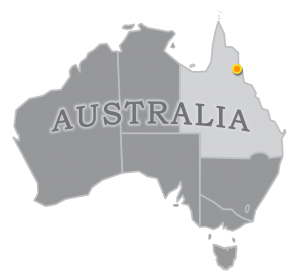 Any young too small at this stage are held over until the following year. 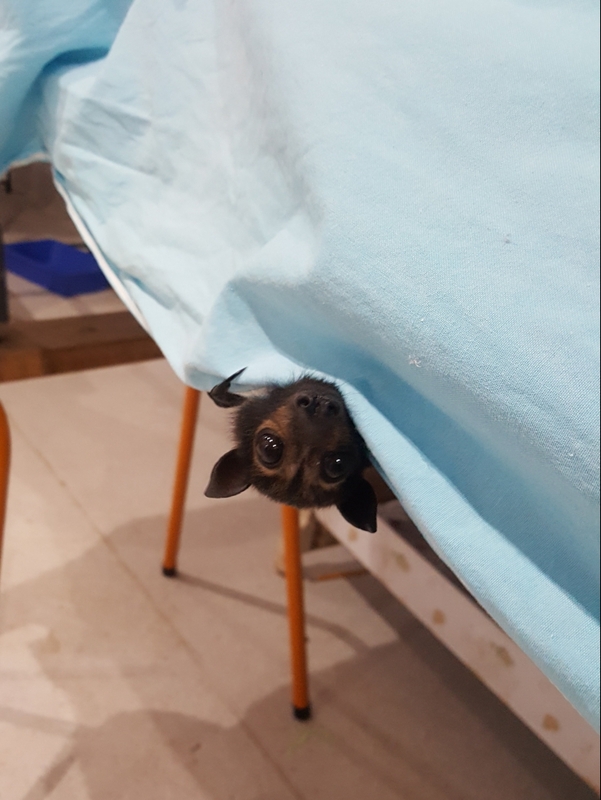 The Spectacled flying-fox colony sometimes leaves Tolga Scrub in the middle of the year, albeit only for short periods, but we don’t want these vulnerable pups left behind. We make our own latex teats for feeding the pups. The hole in the teat must be the right size, if it’s too big the pup cannot control the flow of milk and pneumonia can be the result. Pups in lie-down in the frame under the light sheet. Photo (right): Box feeding is possible once the pups are good feeders and the teats are good. They need to be positioned so that the bottle is balanced properly. 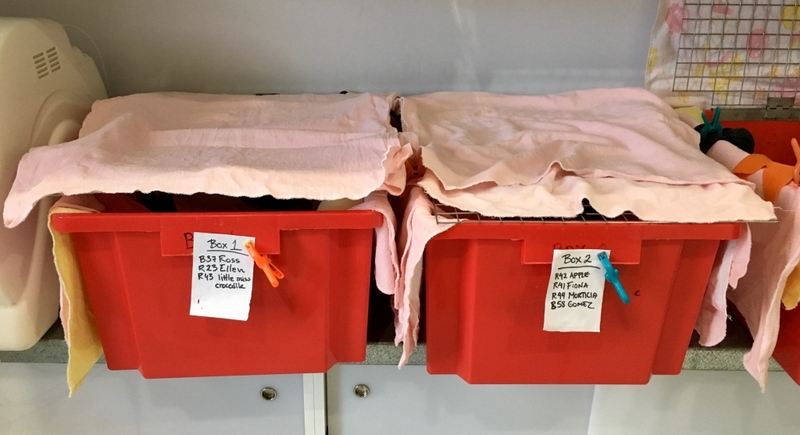 An experienced feeder will be able to handle a few boxes of babies, note the piece of paper with the names of the 4 bats in one of the boxes. 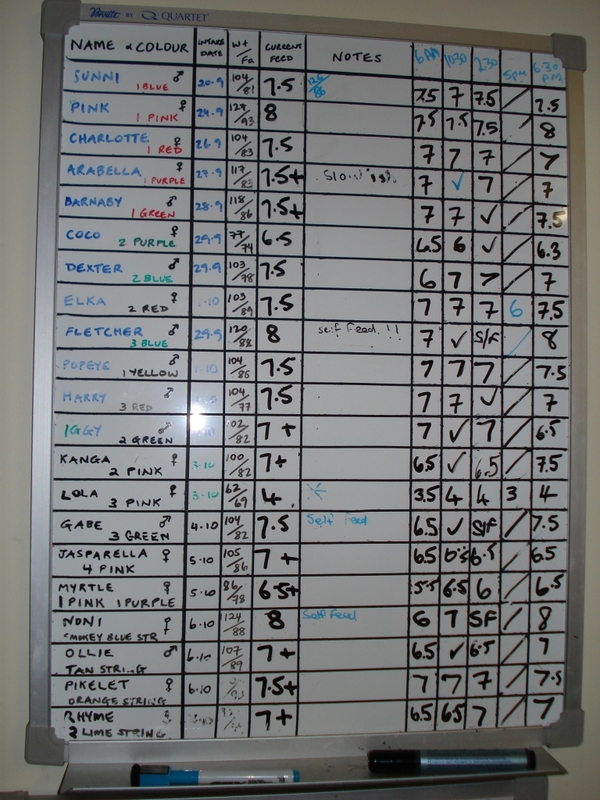 The board on the wall will have in the information about how much each bat is being fed. 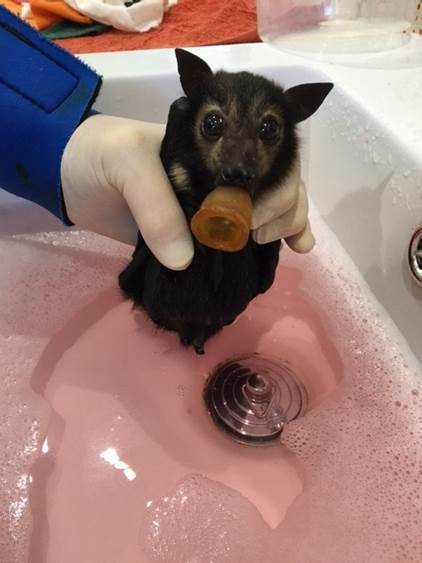 An acro-BAT. The pups experiment with what their bodies can do. Most pups are born with some belly fur, but not this one. 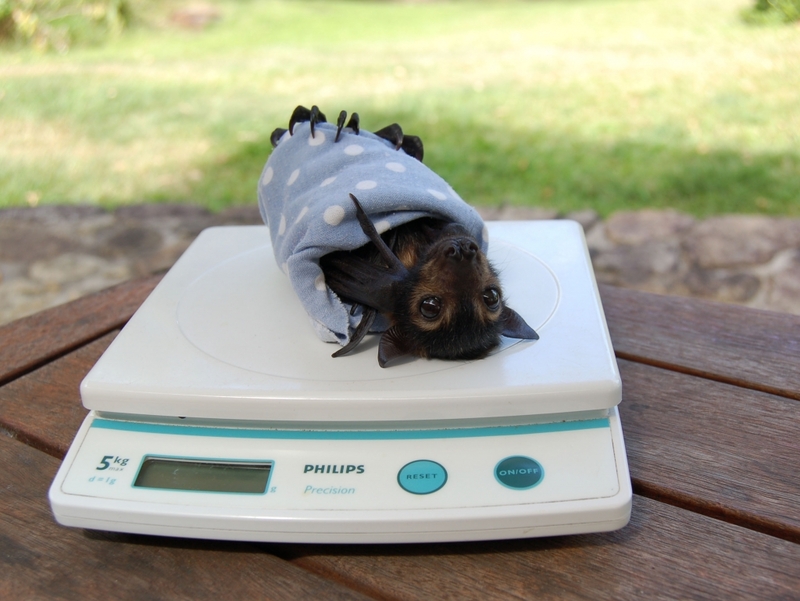 Pups are weighed weekly, more often if we have concerns or they are very young. We do a lot of laundry while the pups are still young. These momma rolls are used for the pups to hold onto instead of their mother’s body. 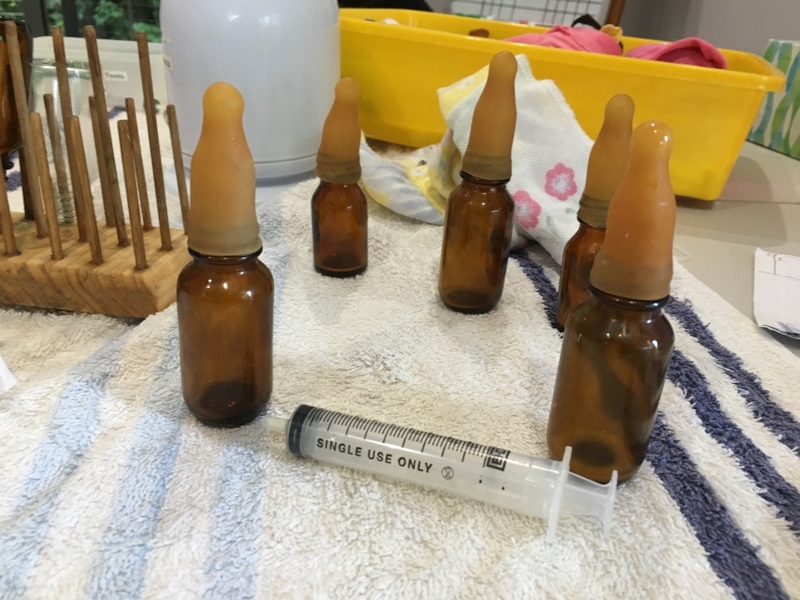 A chlorhexidine bath for a pup rescued off a dead mother. Mixing milk, pouring into bottles, hanging them up, bringing them in when empty, washing them ….this happens 2-3 times a day …day after day. Watch the young pups out in the sun in their boxes. Watch the pups out in the sun on their frames. Watch the older pups eating in the big cage, not long before they go out to the release cage. Watch the older pups coming down into the feeding area from the top of the cage. Watch the pups having their first fruit, watermelon.